Goan crab curry with rice on a lazy Sunday afternoon with my family is a quiet affair. The cracking of shells and the sucking of juices the only sounds. A big bowl sits at the centre of the dining table, filling up fast with remnants of soft, chewed-up shells, and vermillion shards of hard shells; every tender crabby morsel having been patiently prised out. Crab curry, in my home, is normally cooked for lunch on a holiday, to be eaten patiently and meticulously so that the soul along with the belly is fully satisfied. This is slow food – spices roasted and ground up and cooked with artful care and taking time to savour and enjoy the meal. This feast is almost always followed by a nap. Earlier that day at the nearby fish market, the heavy, rotund, mud-green crustaceans caught my eye with the tap-tapping of their orange-tipped claws on big blue baskets. I imagine, till a couple of hours ago they would’ve been scampering across the fertile mud baths of the swamp-green mangroves. 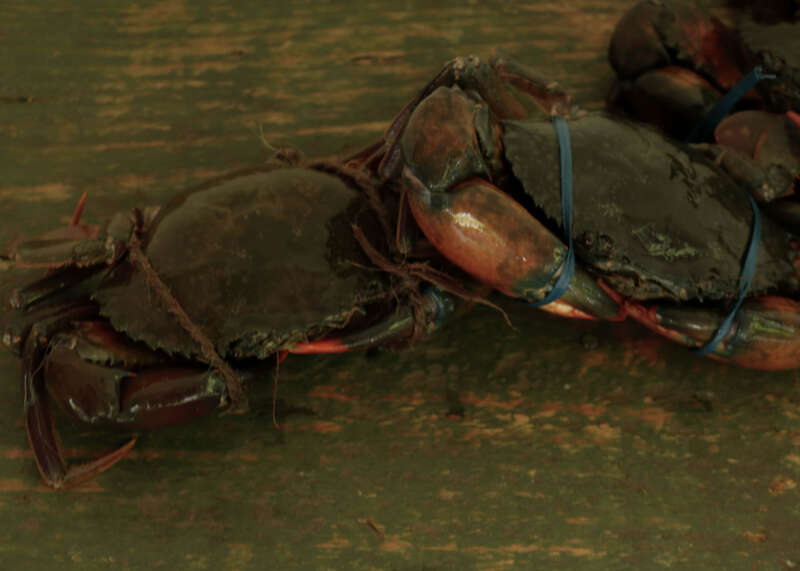 Inhabiting the backwaters, estuaries and lagoons of coastal India, crabs (both orange-tipped and green varieties) are popularly cooked in rich curries. I could not resist these plump crabs, fresh and still smelling of the sea. One fat, feisty one almost snapped off the tip of my finger when I tried to lift it to gauge its weight, (despite the hemp rope around its claws) . An important tip when buying crabs is to select the ones that feel heavier – weight rather than size is normally an indication of meatiness. Also look out for those with fat claws. You can be sure there’s plenty of sweet meat in those nasty pincers. And yes, always buy these delicious critters live. Fresher the crab, more delicious the crab curry. A dead crab on ice is an absolute no-no, in terms of both flavour and freshness. If like me, you’re queasy about plunging them live and kicking (literally) into boiling water, don’t worry, there are more humane ways to put them to bed. Just pop them into the freezer for an hour, where they’ll slowly, surely and most important, painlessly, doze off into a deep, deep sleep. Then you can proceed to wash and cut them up. Twist and pull off the pincers and the legs. Next, cut the body (with the shell on) into half. Remove the feathery lungs or ‘dead man’s fingers’. Contrary to popular perception, they are not poisonous. But it’s true that they don’t taste very good and have a weird texture. Retain everything else ensuring that all sand/mud and grit is washed out. If you would rather not dress the crab yourself, I suggest that you buy the crab live and have your fisherman cut it up for you. Western cuisines discourages strong spices in the cooking of seafood. While I enjoy the delicately flavoured garlic-butter, lemon and dill scented sauces they prefer, I also think that Indian cuisine has expertly paired fish and shellfish with spices and coconut in a way that complements the seafood rather than overpower it. The evolution of coastal cuisine over thousands of years displays a high level of sophistication and complexity. There are intense curries like this crab curry and there are drier dishes with soft and crispy bits; you could call them stir fries. There are also delicate coconut milk stews, sweet, like gentle rain. Here, in Kerala, I love observing foreigners trying local seafood preparations, their initial apprehension followed by happy surprise at discovering that spices when rightly used can elevate and enhance even the most delicate fish and shellfish. Any crab curry originating in coastal or South India generally has a coconut-based sauce, which gives the naturally sweet flavour of crabs a silky richness while tempering the spices. 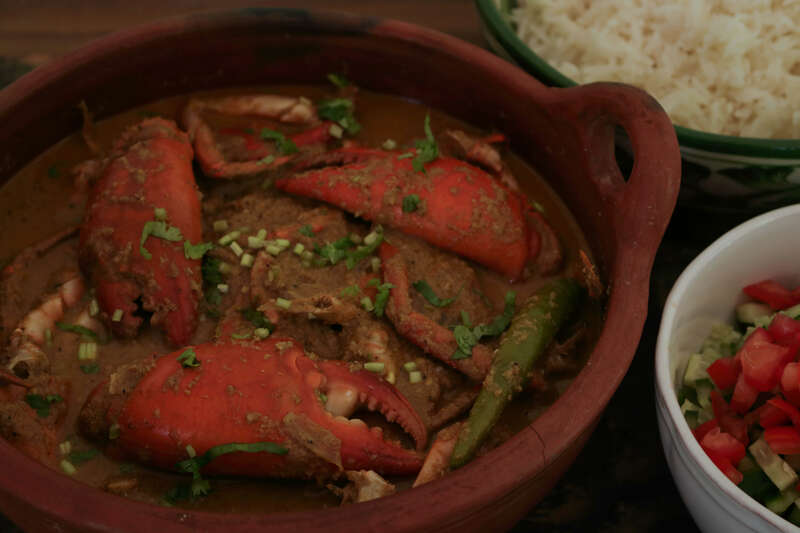 This crab curry recipe comes from Goa on the western coast and like most Goan dishes combines chillies with spices and fresh coconut in a thick aromatic sauce that is either mixed into steamed rice or used to dunk paos (local bread) into. Lightly toasting the freshly grated coconut and the spices helps release their oils. Saturated with flavour and aroma, they are essential for producing a well-rounded crab curry. I like my Goan crab curry with steamed rice and maybe a crisp salad of chopped cucumber, tomatoes and fresh coriander tossed in tart lemon juice with a light sprinkling of salt. This crab curry recipe allows me the convenience of making the spice paste (and even the curry) the day before. I think the flavours get time to meld if left to rest overnight. Sharp edges if any, mellow down and the salty, sweet, hot and sour seem more harmoniously combined. So, you can make the sauce a day earlier, bring it to room temperature and reheat the next day before adding the crabs and simmering till they are cooked. No stress at all. 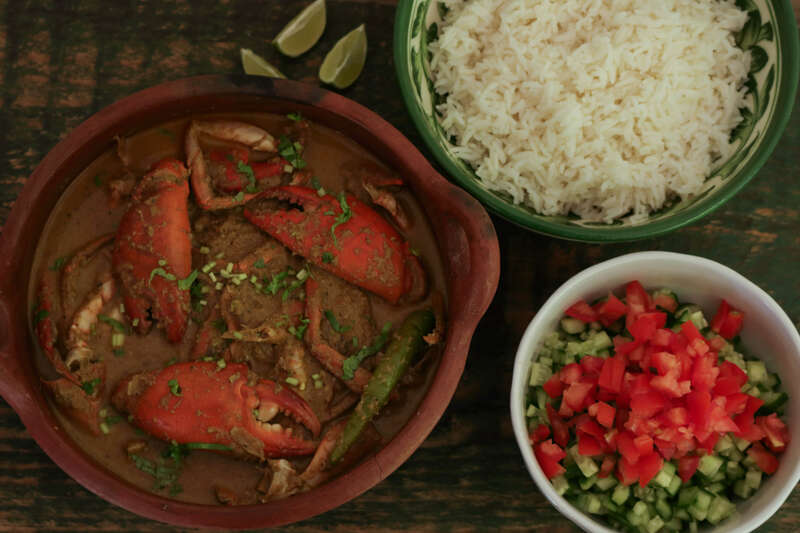 If you haven’t tried your hand at a Goan crab curry yet, now’s the time. This recipe is simple and straightforward and you will probably want to include it in your seafood repertoire. Heat a skillet on low heat and lightly toast the coconut for a minute before adding the rest of the spices (cloves, chillies, pepper and coriander) and toasting for 1 more minute, taking care not to burn them. Cool the spices and grind to in a food processor. Add the turmeric and ginger and garlic and grind further to make a thick paste with a little water. Heat oil in the same skillet. Throw in the curry leaves and the onions. When the onions are lightly golden, add the spice paste and saute on low heat for a couple of minute till the smell of raw garlic and ginger changes. Add the tamarind pulp, green chillies, salt and 200 ml water and bring the sauce to a gentle simmer. Cover and gently cook for 2-3 minutes before putting in the crabs. Coat the crabs well with the sauce, check the seasoning and simmer for 7-10 minutes till the crabs are cooked and turn a bright vermillion and the sauce is slightly thickened. This seafood curry sounds simply divine. Love all the spices that go in it! Where did you add the crabs ? Hi Shilpi, thanks for pointing out the error. It has been rectified. You can see the complete recipe now.